Online documents are documents that can be created, stored, and shared in iMeet® Central. Online documents can be edited in the browser, without any additional software required. A WYSIWYG ("What you see is what you get") text editor is provided for editing the content, layout, and design of online documents. 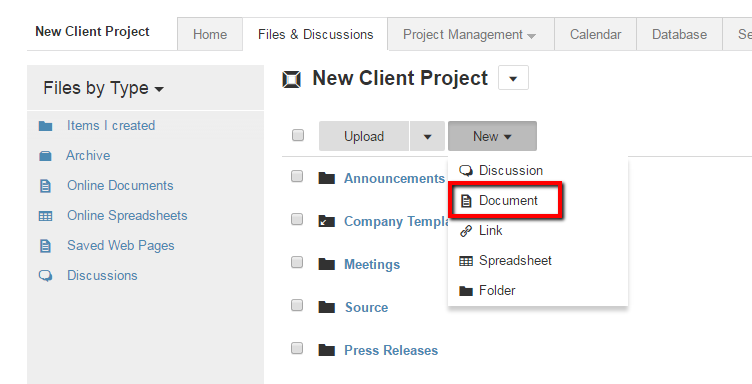 To create a new online document, navigate to the Files & Discussions tab and click on New > Document. Edit Related Tasks & Milestones: Allows you to edit related tasks & milestones. Audit Log: Ability to see history of exactly what has happened to a document. Version History: Allows you to compare previous versions of a document. Add Comments Via Email: Ability to add comments by emailing an email address provided. Add Password: creates a password required for any user to access the online document. Move: Give you the option to move to a different location. Rename: Allows you to rename the file.